Old favorites are once again available for a new generation of young readers. 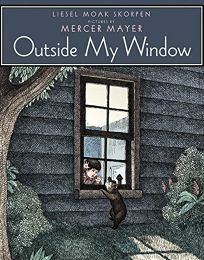 Mercer Mayer adds color to his original illustrations for Outside My Window by Liesel Moak Skorpen, originally published in 1968. Mayer fans will want to see these enchanting early cross-hatch pen-and-inks in all their glory, as they chronicle the tale of a boy who sees a tiny bear peering in at him through his bedroom window one night and invites him inside.